Calf Hill Day 6 – Rain Stopped Play! Although the day dawned warm and fine, a halt was called to digging at lunchtime due to heavy rain and thunder. Even so, some tantalising clues were beginning to emerge from both trenches. Calf Hill dig, Day 6. Trench 3, context 3. Cleaning the cobble layer in the west of Trench 2, few finds were uncovered other than pieces of chert. The cobble layer is very solid in construction and is not natural. A sondage was put in the eastern section of the trench to determine the nature of the construction of the bank. In doing so, a dark, linear feature was discovered which contained a small fragment of clay pipe stem. 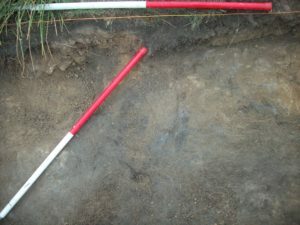 The dark feature probably dates to the 19th century (dated by the clay pipe), and having cut through the bank shows that the bank is earlier in date than this. The core of the bank was also found. It would seem that the bank has either eroded or been robbed out at some stage. Final day tomorrow! Will there be more questions than answers? Only time will tell….